Potent DNA topoisomerase I inhibitor. Displays antitumor activity against a variety of tumor types. 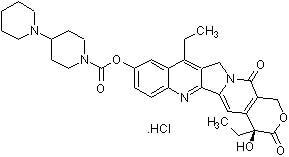 Active metabolite SN38 (ab141108) also available. Our Abpromise guarantee covers the use of ab141107 in the following tested applications. ab2893 staining γH2A.X in HeLa cells treated with CPT 11 (Irinotecan) (ab141107), by ICC/IF. Increase of γH2A.X nuclear expression correlates with increased concentration of CPT 11 (Irinotecan), as described in literature. The cells were incubated at 37°C for 6 hours in media containing different concentrations of ab141107 (CPT 11 (Irinotecan)) in DMSO, fixed with 100% methanol for 5 minutes at -20°C and blocked with PBS containing 10% goat serum, 0.3 M glycine, 1% BSA and 0.1% tween for 2h at room temperature. Staining of the treated cells with ab2893 (5 µg/ml) was performed overnight at 4°C in PBS containing 1% BSA and 0.1% tween. A DyLight 488 anti-rabbit polyclonal antibody (ab96899) at 1/250 dilution was used as the secondary antibody. Nuclei were counterstained with DAPI and are shown in blue. Publishing research using ab141107? Please let us know so that we can cite the reference in this datasheet. There are currently no Customer reviews or Questions for ab141107.